People from the 90th to the 95th percentile make about 11% of total income; people from the 95th to the 99th percentile make about 15%; and people in the top percentile make about 23% (in 2006, presumably). But mainly, look at the way that black line shoots up relative to the others since 1980 (along with financial sector profits and per-employee banking compensation). I don’t want to make too much of this. But I think it is true that the pitchfork-wielders of today are not rock-throwing Trotskyites; they are, largely, politically moderate (or conservative) people who believe in capitalism and in making money. And I also think that there has been a relative shift in economic fortunes away from the small business owning class that we like to think of as the bedrock of American society (the modern version of the yeoman farmer of the eighteenth century), and toward a new elite made up of corporate CEOs, investment bankers, and hedge fund managers. Where this will end up I do not know. This entry was posted in Commentary and tagged inequality, sociology. Bookmark the permalink. That’s what Yves Smith always says about her circle. Of course, except for a few bloggers and a handful of others, we never see these closet rebels actually step out into the light to become activists. As you say, they’re not public interest reformers but disgruntled, relatively small-time hoods who wish they could be bosses. “Revolt of the petty bourgeoisie” is a thumbnail sketch of a fascist movement. The present banking policies benefit a small minority. Very few people benefit from a state-subsidized banking cartel other than the banking cartel itself. This is something opponents of the present policies must emphasize and demonstrate in hard dollar and cents terms if they are to succeed in repealing the policies and establishing better, in many cases like restoring the Glass-Steagall act time *proven* policies. Count me as one of the “raging 1.5%”. That stat about CFA holders is very interesting, and makes me feel better about my colleagues (should be a good proxy for the rank-and-file of the major financial institutions). However, there is enormous pressure to conform to the top-management’s view of the world when you’re working at a TBTF bank (possibly most large American corporations). The members of the executive team have gotten to where they are largely by conveying the sense that they “know best”, which usually includes characterizing dissenting opinions as childish or naive. Larry Summers is a great example of this. Ironically, Lloyd Blankfein isn’t. For whatever reason, he doesn’t have the “aura of smugness” that you typically encounter with the CEOs of large companies, IMHO. I think you are on to something here. To be really angry about this you need (1) to be educated and smart enough to understand what’s going on and (2) to have enough skin in the game to give a crap. Condition 2 knocks about 95 percent of the income distribution. Condition 1 gets most of the rest. I’ll add another. A lot of very capable boomers passed up on Wall Street careers to do other things when they left college and professional school. It was a very idealistic era, when social service and higher purposes were part of the cultural mix that went into career choices. These same people must feel that they could have done quite easily what the Paulsons and the Rubins did, but chose a higher purpose. They don’t view these bankers are more successful people, but as more venal ones. And given the way they behaved, that’s not a bad description of the people who almost wrecked the economy. Thanks Mr. Kwak, a picture is worth, a thousand words. I agree with the sentiment, but I wouldn’t characterize that type of success as “easy”. These guys worked there asses off to figure out how to rig the system in their favor. But *luck* certainly had a lot to do with just how MUCH it worked out for them. The guys who thought up Fannie/Freddie, CDOs, CDS, or any number of financial “innovations” likely didn’t have any idea how much money could be concentrated at the top as a result of their actions. Bubble Denial – Hoo boy! Is that Yves Smith over on the left? Ed Harrison in the background? Oh, I guess not. Don’t be confused about who will be carrying the pitchforks when the going gets interesting: it’ll be the “community organizers” and the union goons, and they’ll loot whatever they can without the slightest thought about whether the US will remain a hospitable environment for your next startup. I’ve been wondering, re your wonderful (awful) chart and the general thrust TBTF political warping of the system, what you guys think of the deep structural relationship between wealth inequality on this level and the (historicaly escalating) pattern of debt/bailout crises? If essentially ALL the liquid capital in the world (or at least the Western World) has to pass through these same sticky paws to be reinvested for ever higher rates of return, aren’t debt crises inevitable? Question: “Lets talk about the human aspect of this crisis….you’ve had this human financial crisis millions of people lose their houses, go out of work…. do understand…sitting on top of Goldman Sachs…do you understand that human cost? Hmmm…. the apple doesn’t fall far from the tree. Doing God’s work. Terrific graph. Wonder where the money is missing for our manufacturing base??? It’s the gap between that black line and another income group absent from the graph. That’s so Blankfein can do “God’s work” with credit default swaps. Who can dare to doubt he’s performing his “higher calling” as financial intermediary and seeing capital is being put to its most efficient forms there, eh??? But you are forgetting many CFAs such as David Merkel, who seem to think the system doesn’t need more regulation. Certainly he seems to have few complaints with things. But that’s because Merkel is more sophisticated than the rest of us, who should never dare to question the system because David Merkel knows we’re just not sophisticated enough to ask these questions (much less answer them). It seems kind of obvious to me that the angry people that Lewis and Lydon and you talk to will be well educated, fairly wealthy people. That doesn’t mean those are the only angry people. The 1.5 percent better start looking over its shoulder at the 90% of the country that gets to split up less than half the country’s wealth. This group has been pacified for thirty years by the lie that the rising tide will lift all boats. The 90% are waking up now, and their anger, while not yet expressed in books, will probably end up being a greater historical force than the bitterness of dentists looking to get their books signed. Many of these 90%, by the way, have also worked hard and care about making money. Didn’t you see Charlie Rose’s softball interview with Blankfein??? Now if Charlie Rose can figure out what questions you’re not supposedto ask, then surely you can figure out which questions you are not supposed to ask. Down girl down!!! “Revolt of the ‘petty bourgeoisie'” seems like a pretty decent thumbnail sketch of the American revolution. Fascist parties in Germany, Italy, and the UK in the 1920s and 1930s weren’t primarily class-based movements — they rallied support from a wide range of economic classes based on nationalistic and racial grievances. The French Revolution encompassed a whole swath of cross-currents. The relative inexperience of the French in representative democracy probably exacerbated tensions. What’s the historical precedent in this case? Hard to say. Maybe a reverse-Reagan, or a reverse Thatcher revolution. It’s a reaction against a certain variety of Free-lunch Conservatism. Proving once again what one popular central banker can do. Easy money and don’t forget, “the market will take care of fraud”. You can tell Blankfein’s getting political crisis management. I bet he spent his whole life NOT talking publicly about his dad’s job at the post office. Now, he does. There’s a little hint in here about where our banking industry is heading and what their future CEO’s may look and sound like. The group that’s been pacified for thirty years ARE the ones who became well-paid professionals. That’s the chance that American society offered the children of immigrants, workers, and laborers. Their parents never expected to be doing better than they are now. The threat is that that way out of the working class is now being cut off. There are no jobs for college graduates this year. And the government is doing almost nothing, except to bail out bankers. I agree with Master as a retiree of a TBTF bank. I would add, however, that with the M&As of the 90s, the management focus changed from running a solid competitive operation to keeping wall street analysts and investors happy. Sr. Management wants to control the message and purposefully avoids metrics that reflect the true condition of the operations and employees who would make them visible. (RTTNews) – “The Securities and Exchange Commission named former Goldman Sachs executive, Adam Storch, Managing Executive of its Division of Enforcement, a newly-created position. Storch was Vice President in the Business Intelligence Group prior to his joining SEC that enforces federal securities laws, regulates the securities industry, the U.S. stock and options exchanges, and other electronic securities markets. “… I pray to God that hell is real and painful because I know that these guys are going there. It should surprise no one that the petty bourgeoisie would want to take away the rope. How about a hybrid of the Newt Gingrich and Scott Brown strategies??? He could convert to Catholicism while simultaneously driving a pick-up truck. Get it on video and it’s sure to go “viral” on youtube. It could be a problem later when he goes to visit the “homies” in Brooklyn, but Lloyd will “take one for the team”. 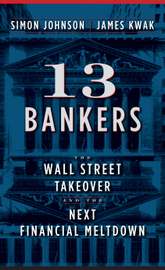 Reaganomics – make the common person (the Pitchfork mob) think you’re on their side while you continue to deregulate the financial industry (Chapter 3 of “13 Bankers.” Have the book next to me when I fall asleep at night (yes, brought the book home from work to speed up on the reading). If I get to meet Mr. Kwak, please sign my copy of “13 Bankers”, as Simon has already obliged). This win lose system we have does not make enough losers I guess, and win somewhat is good enough for to many and secretly want to be an elitist to. And, now we just talk of symptoms of this mess and never talk of the root cause of this corruption. The untouchables, the Central Bankers. We need to get that or this reform stuff is just a diversion. Or, we have been slaves to long to think it can be anything different. Sic. I think you know the truth about where this will end up if you can stomach it’s acknowledgment. These bankers that everybody keeps trashing are doing exactly what our current market structures compel them to do, namely maximize shareholder profits at all costs. They can be sued if they don’t. Gone is the America with the broad and booming middle class. The infrastructures of advanced industrial economies after WWII had rebuilt to full capacity by the seventies and new sources of revenue had to be sought out, enter Regan. Globalization or lack of wage inflation coupled with technology are going to continue to push revenue up to the top. Can we change the laws? Fat chance we are way out gunned. The Senate is gridlocked and both sides of the aisle are making to much money to genuinely care about a bill with teeth. So how does it end? It ends with the increasing complexity and velocity of financial transactions in the global system, resulting in an explosion and subsequent collapse of the monetary system as a way to sustain our species. Good riddance, could you imagine if for the last thirty years we had the physicists on Wall Street working to create abundance in society instead of scarcity? Michael Lewis’s observations synch perfectly with what I’m seeing in my tiny corner of the world. This post is a ‘bulls-eye’. Where this will end up I do not know. I have been curious to see the lorenz curve (arcane economic plot) shown in 5 year increments to see how the concentration of wealth has changed over time, but this is a far more powerful illustration. Thanks James…you’re a hero of mine. Although the radical nationalists, street fighters, and adventurers comprised the leadership and get the most press, the socioeconomic base of the Nazi party was small businessmen, white collar workers, students (because they aspired to white collar jobs but saw no good job future under the Republic), and later small farmers. The NSDAP was originally formed by skilled workers who saw themselves being crushed in a vise between the capitalist and the influx of unskilled foreign labor, which they saw conventional socialism as favoring. That was the genesis of the “national socialist” concept, which dates back to the latter 19th century. It’s similar today – these persons still see themselves as rightfully part of an “elite”, they despise the workers in general (to whom they consider themselves superior), and they’re disgruntled because those who are according to their own measure their betters aren’t letting enough wealth trickle down to them. So rather than take the leadership of a true anti-kleptocratic movement (something they’d be well suited to do), they whine about how all they want is to be a better-paid part of the kleptocracy itself. They have no problem with the crimes in themselves. It seems your tail wagging is much more mushy than mine…. carry-on…. Who regulates the most? The Father who tells his kids to be careful when they go out and play or the father who offers the kid some important incentives to only play where some experts have deemed to be safe. If you agree it is the second father, why do you insist we had deregulation? Manufacturing is increasing across the world, but manufacturing jobs aren’t, because technology is increasing the productivity of workers, leading to a reduction in industrial workers, because there isn’t enough demand for it, the same way that Japan tried to force certain industries to grow in the late 90s — there was not enough demand across the world for the heavy industry they wanted to expand. Ted, you give me too much credit if you want to make me your demon. My views are complex, and not easily reducible to a few easy statements. I may lean toward libertarianism, but I also think that financials should be strictly regulated because of the harm they can do to the economy. There is something about borrowers who lend that end up destroying a lot of businesses, and themselves as well. That said, I favor intelligent regulation of financials because often the government does not know what it is doing. I have seen that over many years working in insurance and finance. If the government will regulate, first understand the industry and its economics. Second, look at the abuses. Third, look at the unintended consequences of regulation. Finally, do it! Don’t listen to the screams from the industry. Regulate them! But make sure that you are genuinely hitting the target, and not doing something to assuage the populace. Ted, I am clueless as to what I did to offend you. If it is over 144a, I would simply tell you that is not a major problem, and that there are good aspects to the rule. There are bigger crises to fight. They’re paying the losers off in debt too, ya know. There is a such thing as a tipping point…many people being critically poor and you can bet the banks and congress are aware of that line. We’re drawing on everything we built over 70 years, reserve currency and all, everything… to bail the perps and the victims both. Sorry the working class is to Balkanized for mass action. I myself am busily waiting to see whether the upcoming Supreme Court nominee is a Female Protestant Asian-Chicana from the Mountain West. Because if she isn’t, I’m going to be really pissed. This is exactly why most of my animus is directed at central bankers. (most, not all) Banks and corporations? We KNOW what they do. But, central bankers? Most Americans presumed that they had different interests. I either never believed that or, I thought the central banking system was a dormant control fraud waiting to happen. Either way = bad. Add up the conflicts of interests and the revolving doors and here you are. The central bankers knew, easy money, like water, would find a way out. I saw historic graph overlays of housing prices for years. It was clear to me. Total household debt. Home equity loan commercials all night long. wages flat. Come on, folks…this was obvious while it happened. I didn’t know how it would end, but I knew it would end. The central bankers did too. There was no other way out except a sudden explosion of real growth for no discernible reason that didn’t yet occur all decade? The whole thing was on debt. They all knew it. When things slowed, they let them leverage up. There was no real growth all decade. This isn’t worthy of debate anymore. It was and is that obvious. We need more than bank reform, we need a new central banking statute. This reminds me. The other day I had a thought…they have everyone debating details of synthetic CDO’s. I don’t know if that’s necessarily a good thing. Seems many people lost the big picture. This is a big picture problem. We can’t ever do what we did in the 00’s. We can’t ever have a central banking system that creates transcripts like that when 40% of your neighbors are vacationing on their second lien. We let fools who thought they could contain their largess fool the country. The synthetics were one part of a much bigger picture. Good post, James. Very revealing data. Looks like the great communicator (Reagan) initiated the great disparity. How appropo that his economic policy was labeled trickle down economics. Trickle certainly is the operative word. Also, it’s somewhat disturbing that the current disparity peak is identical to 1928. And we all know what year came after 1928. Every generation is filled with young overeducated people who swallow academic bulls**t and run out to campaign for Bobby Kennedy or Obama or some other grandstanding fraud. They wake up in their thirties and wonder what the f**k they can sell to make ends meet. Truly intelligent people understand the world is so f**ked up that one hundred thousand genuinely committed truly altruistic geniuses given plenary power to change anything and everything (people like Russ, for example) wouldn’t even have a clue where to start. For those who think otherwise, I recommend a long and difficult novel called JR, written in 1973, which could have been written last week without even changing a word. The only real tragedy in all this is that William Gaddis is dead and cannot give us any more of the truth. A neighbor of mine is an unemployed physicist, now in his forties, who has given up all hope of employment despite owning more than 50 patents dominating an important field and being infringed on a daily basis by kleptocratic corporations across the globe. He tells me the average physicist (not employed on Wall Street) earns $65,000. Life in America has become a simple matter of crawling into a niche and hanging on there for dear life even if it means eating s**t twelve to sixteen hours every day and producing not much more than cancers inside your own body. Anyone tell you different doesn’t know any more than Larry Kudlow. Where will we end up? Well, if it doesn’t get satisfactorily resolved, Russ has it about right… Fascism seems most likely in the long term. Don’t waste time arguing with Ted. He’s doing God’s work, one hand ringing paragraph at a time. Does this explain the Tea Partiers? I had noticed that the tv images of Tea Party rallies look very white, very affluent, very suburban. But the recent holiday season revealed Tea Partiers among extended family and friends (as in, people from real life). This was surprising because on TV the Tea Party people seem affluent but very misinformed. However, the Tea Partiers I know are very well educated and otherwise very rational people. It was very surprising to hear some of the vitriol, as well as….wait for it….devotion to Glenn Beck, coming from such well-educated, usually well-informed people who otherwise are not suffering from the econ crisis. (I’m still getting over shock from the Glenn Beck thing.) But if their wealth has turned out to be paper illusion rather than a reflection of their solid/clever/successful investing, maybe that’s fueling the fire. There’s a lot to think about regarding class divisions in America. A 9/11 detail that has stayed in mind particularly through the banking crisis is about the employees of Cantor Fitzgerald who occupied high-level floors of the World Trade Center where the space was cheap because it was difficult to lease after the ’93 bombing. The NYT’s noted that most of the victims from C-F were a young generation from working class families largely from NY/NJ who achieved astonishing wealth at very young ages. C-F was different from similar firms because they hired so heavily from local, often Catholic, colleges more so than from the Ivies. There’s something about how this group “made it” but that success involved high risks, even to the point of high risks from the financial incentives for the location of their work space. In general this country has some issues regarding the definition of “work” and “merit”. Angry Tea Partiers I’ve met regard their affluence as earned by their work, merited through their educations and self discipline. They’re successful because they deserve it; they won in a fair fight. But at the same time the financial crisis challenges their status by showing how they’ve been aided by advantageous tax policies and lax financial regulations; suggesting they are passive recipients of benefits—that success is in spite of, not necessarily because of, their own actions. And that seems to be the point of departure from rational thought or conversation (little touchy there at the holiday dinner). Interesting. Uh-oh, you’re going to be pissed! She’s merely a Harvard Law Dean– with no publication record. ie., an aging Adam Storch. Someone (Max Dimont?) referred to the rise of the fascist movements across Central (& Western) Europe in the 20s (and 30s) as fuelled by the “frayed white-collar” class; those who had had prosperous and stable lives before WW1, but because of the economic dislocations caused by defeat in the war were set adrift in a suddenly uncertain world. Goldman Sachs Group Inc. may enter talks to settle U.S.
“Securities and Exchange Commission fraud charges as soon as today, Fox Business Network’s Charlie Gasparino reported. Goldman officials believe the SEC’s case is without merit, but the firm does not want to battle with regulators, the report said, citing sources including an unidentified senior executive at the firm. – Move along folks there is nothing to see. Why wouldn’t today’s pitchfork holders be the people who believe in capitalism and making money? The money finding its way to the super-“enriched” came from somewhere and in most instances its from people who actively believe in and engage Wall Street. This group not only has anger, they have a truer understanding of exactly “what just happened” and perhaps rightfully they feel quite betrayed. There is a larger more broad population of anger, but its a more general “greedy bankers” kind of anger which is quite generic. They lost jobs and homes because of the actions of Wall Street but this group probably never had an expectation that Wall Street worked for them in the first place. The current pitchfork holders on the other hand either directly or indirectly trusted Wall Street to do right by them and had an expectation that Wall Street would be fair with them AND no one else. This reminds me of the Barney Madoff scheme because there was an elitist, ‘we’re taken care of’ entitled bent. The problem is the elite were the very ones being robbed. Wall Street clearly has an “us/them” dynamic which even now continues and is endemic of the ‘bankers continuing not to get it’. What ever side you take in the Goldman Sachs situation, in the form of “well they knew what they were buying” sense, it does appear that perhaps ‘just barely’ wealthy and moderately wealthy weren’t being afforded the ordinary treatment they’d come to expect. Hence the pitchforks because this group gets it. Seriously, the more wealthy the banker, the wealthier he needs his client to be. Would he endear himself to how many countless or would he work to curry favor with fewer though significantly more wealthy clients. For a guy dreaming of being on the other side of the table, the math is clear. There was a new recalculation on who’s wealthy and more specifically, who’s an ideal client, and the current pitchfork holders just got the memo the hard way. Who’s Got those Pitchfork’s? The Federal Reserve has those pitchforks, stored up for tomorrows peasantry. Thomas Jefferson warned about such a system centuries ago. Quote:___”If American people ever allow private banks (Central Bank) to control the issue of our currency, first by inflation,and then by deflation, the banks, and corporations that will grow-up around them will deprive the people of all property until their children wake-up homeless on the continent their fathers conquered!” ___My only thoughts of the “World’s Financial Elitist” are – they take solace in their fallen brethren’s mystique as an, “Arm’s Dealer” profiteering by war? My sarcastic reference to the “Founding Father’s of Fiscal Chicanery” goes out in spirit only for my Ox has died. The recipients of my accolade’s go out to the mighty dynamic dual at “Goldman Sachs. May I introduce Sir Hank Paulson,and his illegitimate stepson, the Honorable Lord Blakfein. It was their incestual ilk that brought about the ,”Manifesto Doctrine” ,ie. )”The Thesis of Deceit, for Theives”,the contemporary “Bible” for the corporate’s world required reading. Thanks,and please Simon,and James,..”Never Stop Digging for America’s Sake”! MB, I think if you truly want to understand Tea Partiers, you need to play with this spreadsheet. Look at the implied trends and create contextual benchmarks in your mind. Then once you have your head around the implications, go read today’s news. I just read on the newswire that Faisal Shahzad, the alleged NYC car bomber, is a financial analyst. Somebody please notify Mr. Konczal. Is it worse than he suspected? “•Income taxes: A family of four in the exact middle of the income spectrum will pay only 4.6 percent of its income in federal income taxes this year, according to a new analysis by the Urban Institute-Brookings Institution Tax Policy Center. This is the second-lowest percentage in the past 50 years. Bottomline: Beck and Co. have sold TB’s a myth and are directing their rage at the wrong target. Bottomline: Middle class income was flat from 2000-2007 before the crash brought income (estimated 2009) below a decade earlier. Philip, you don’t mind if I don’t take the bait, as tempting as it looks. Remember the Tea Partier’s Creed… Play Nice. I suspect you really are a Tea Partier at heart. I believe you only have the Nation’s best interests at heart. The spreadsheet outlines what resources have traditionally been available to address social inequities. That is an very interesting graph. What catches my eye is the rise of the top 1% in income shot up to 23% in 1928 just before the Great Depression. Now we are rapidly approaching that income percentage concentration again, or maybe we passed it in 2008-2009. Would really like a current number on that statistic. When great wealth gathers in only 1% of the population does it predict The Big Fall and was this recession really it, or is it still to come?? Unbridled Greed enfolds the seeds of its own demise. But at what cost for the rest of us?? Growth for the sake of growth is the ideology of a cancer cell – Edward Abbey. Thanks to Anonymous for the “All Along The Watchtower” quote. The hour is indeed getting late.. The question not being asked is: Does financialization cause inequality, or does inequality cause financialization? I think it’s been shown that when financialization occurs, capitalists take over the government. So the latter part of the question is the most important. At the beginning of the period of least inequality, 1946 to 1980 top tax rates were around 86%. They rose as high as 92% in 1952. By the time Reagan took office they were down to 70%. And by the time he left office they were down to 28%. Is it any wonder that the financial sector, sitting atop the economic pyramid, prospered and grew dramatically. When this happen the accumulation of capital starts to exceed the need for capital investment in productive enterprises. So the return on capital drops. To satisfy investors, money managers look to leverage, derivatives and stimulation of credit markets to stabilize and increase returns. In the extreme, this pursuit gets out of hand, giant bubbles of one kind or another develop and then burst, creating havoc with the world economy. Regulation is only a partial answer. Capitalists will find ways around regulation, in the extreme by capturing the government. What is needed is to adjust tax rates to bring capital accumulation in line with capital needs. The other side of the coin is generating demand for capital by reducing taxes on income and consumption in the broad middle class. As consumer demand increases, business expands, creating a need for more capital and reducing the pressure to develop synthetic means to stabilize return. As long as were are not addressing the balance in taxes between capital and consumption we will continue to have bubbles. “Hmm. I’ve long been accustomed to receiving a lot of crazy mail, accusing me of being a commie, a traitor, an idiot who doesn’t know any economics, etc.. But the flow peaked a long time ago; after around 2005, as the number of people in major news outlets actually willing to criticize Dear Leader grew, I seemed to stop being Public Enemy #1. Let’s see. The only definition of “canucklehead” I can find is “a Canadian of limited intelligence”. Tea Partiers play nice? Like with the Obama as Hitler posters, right? I’ve followed your postings on Greece, Benmosche, etc. and they make about as much sense as this one. Go ahead and mock the possibility that anyone can “have the Nation’s best interests at heart.” The reflexive, niave cynicism you and your fellow Ayn Randians profess has led us to the state we’re in. Well Philip, let’s say we agree to disagree and leave it at that. The charct is bogus because it only tells one side of the story (income side, other being taxes paid). Per the most recent data the top 1% actually paid 40% of the federal income taxes collected by the the govt. Think this post is the ultimate pessimism? Have you bought anything at all lately? Procter & Gamble,3M, Revereware, Rubbermaid, Dooney & Bourke, Conair, G.E. – name the old, reliable company now selling schlock. Somebody up there wants the middle class to experience belt-tightening, economic or otherwise. There are no longer utilizable products available. Whoever inhabits the financial stratosphere is buying the same crap. This is a universal phenomenon. So who’s the crippled brain that plans all this stuff? What the hell is wrong with being a Roman Catholic? Can you cite a link for this for 2000-2008? “Can’t believe they did not pull the fuse. Remember, I am on record calling at least two market closures in this impending plunge… this chart has the dreaded Island Bottom. This will get closed. You left out the fact that the top 1% also own 42.7% of all wealth in the US.